The Eagles celebrate with David Judge following his massive solo home run in the third inning. 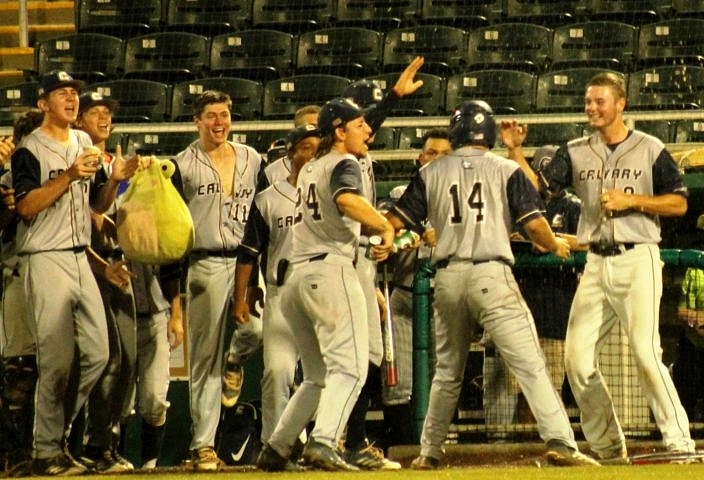 When David Judge makes an impact in the ball game for the Calvary Christian Eagles, it is usually very loud. Such was the case late Wednesday night in the 4A state semifinal at Hammond Stadium in Fort Myers, as Judge made his presence known loudly with his bat. The first baseman connected on a mammoth home run in the third inning that provided some extra momentum, and the Eagles rode that to a 3-1 victory over the Benjamin Buccaneers. Calvary senior Christian Scott earned a complete-game victory in his final outing of his high school career. One of the most excited spectators for the action is the guy largely responsible for helping get the Eagles there, in senior hurler Christian Scott. 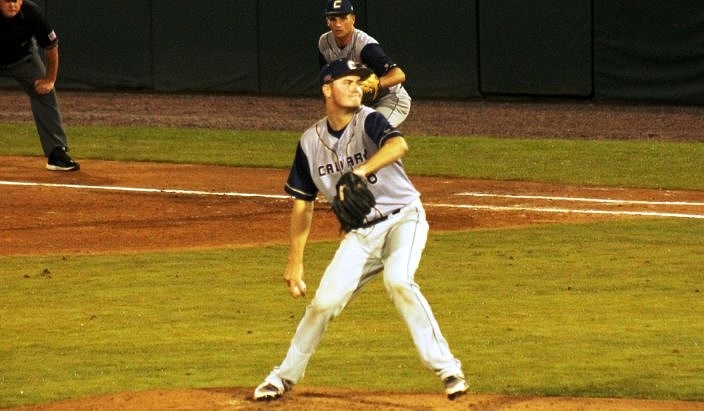 The right-hander tossed a complete game on Wednesday in his final action of his impressive high school career. Two seasons ago it was Scott who pitched and won the team’s first state title, and Wednesday night he made his final start just as memorable. The Bucs (24-5) loaded up the bases to push Scott closer to his pitch-count limit. 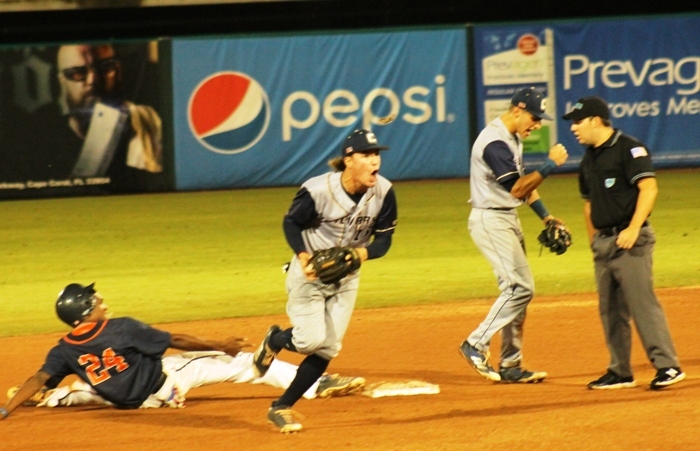 Jack McCluskey singled to left, Isaiah Thomas was hit by a pitch and Kris Armstrong singled to center. Paul Lanoce then battled in a great at bat to earn himself an RBI single on a liner to center field that broke up the shutout. Roberto Pena races off the field after catching out a potential base-stealer in second inning. But Scott dug in and struck out the next two batters to finish things off and send the Eagles back to the championship game. Now in order to be crowned the champ they must dethrone the current holder, a team that has won 60 straight games dating back to the start of last season. The Warriors and Eagles missed a chance to compete against each other in last year’s title bout when the Eagles were defeated by Pensacola Catholic in the semifinals. Coach Kunkel recalled the tough road the Eagles went through during the playoffs. Calvary battled past two of Miami-Dade’s toughest in Westminster Christian and Florida Christian, while also enduring multiple weather issues that plagued the state during much of the regional playoffs. Games were started and then stopped, and rescheduled numerous times. It added further challenges to an already challenging situation.